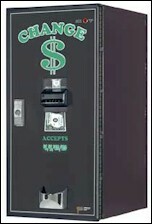 Advanced Technologies offers a complete line of bill changers for bulk changing of paper currency into coins. 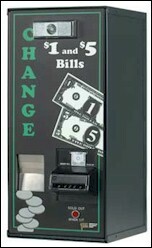 US bills can be changed into quarters or dollar coins. Box integrity is assured with full body hinge and screw type lock. The AC bill changers are warrantied against manufacturing defects for a period of two years from date of shipment, to be determined by the serial number on its main board's microchip. Warranties for components of the AC bill changers, if different, supercede this general warranty. 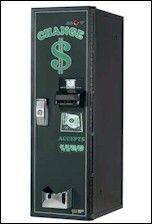 Specifically, the bill validator is warrantied against manufacturing defects for a period of two years from date of manufacture, to be determined from the first four digits of its serial number (wwyy).